El Segundo, Calif./Jan. 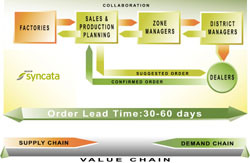 3, 2001- Syncata, which provides business consulting, and demand and supply chain management solutions to Fortune 1000 and middle market companies, has completed American Honda’s Market-Oriented Vehicle Environment (MOVE), a network-based collaborative solution which helps the automotive manufacturer balance dealer vehicle requests against factory supply, dropping the automaker’s channel inventory to just 38 days, according to “Automotive News”, a weekly trade magazine which charts weekly Domestic and Imported Car and Light-Truck Inventories. The findings put American Honda in the industry’s top 2 percent. “MOVE is a demand optimization system that delivers hard data from the dealerships, allowing the factory to distribute vehicles based on actual market demand,” said Ujj Nath, co-founder and CEO of Syncata, which specializes in helping automakers use demand-driven forecasting to reduce inventory levels, transaction costs and lead times. “It’s no secret automakers can boost per-vehicle profits if they don’t have to slash prices to sell cars that aren’t what consumers really want,” said Lalit Jain, the Syncata engagement manager on the American Honda MOVE project. “Honda is using business intelligence to give their sales force the models and styles they want, based on what their customers really want, making MOVE a win-win for consumers and dealers alike,” added Nath, whose team of automotive supply chain specialists used Sybase, Microsoft Visual Basic and UNIX/C to construct the initiative, which lets dealers modify their orders within the confines of their basic vehicle allocation. Running on a legacy system, MOVE lets dealers choose from roughly 500 options for configuring vehicles in their monthly orders, then consolidates those orders to the individual plants for factory production. “From a tactical standpoint, we understood the success of this project hinged on our ability to collaborate effectively with our dealers. Since MOVE has been able to accommodate dealer requests 95 to 98 percent of the time, it has dramatically reduced the number of dealer trades and given the factory better visibility over customer tastes,” said Dan Bonawitz, senior V.P. of corporate planning and logistics at American Honda. Furthermore, American Honda can respond to shortages by programming limitations into MOVE to reflect deficiencies, so “dealers can configure up to a point and then make more informed choices,” added Bonawitz. Syncata provides business consulting and systems integration services that help companies plan and implement innovative demand and supply chain solutions. We help clients collaborate effectively, plan adaptively and respond rapidly to enhance business performance and realize measurable value. Syncata assists clients in assessing strategic options and guides them through the detailed process of change management and technology implementation involved in delivering a practical solution. Syncata has over a decade of experience working across various industries including automotive, high-tech manufacturing, financial services and insurance.